The RIDGID HYPERDRIVE 18-Volt Brushless Brad Nailer is taking pneumatics to the next level. Using the industry-leading feature set of Fasten Edge Technology, RIDGID HYPERDRIVE offers you all the power of a pneumatic nailer in a cordless tool. With no compressor, no hose and no gas cartridge, this 18-gauge brad nailer enables faster set-up and easier maneuvering on the job site, driving 18-gauge nails from 5/8 in. to 2-1/8 in. HYPERDRIVE™ Technology - Provides cordless convenience, eliminate the need for a compressor, hose, and gas cartridge. 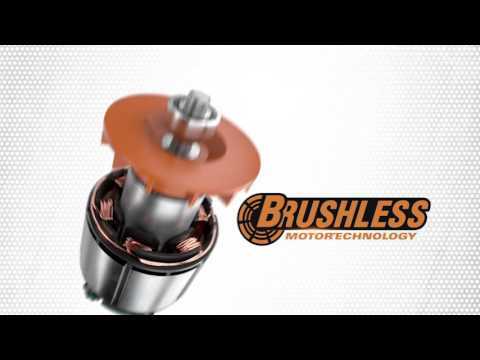 Brushless Motor Technology - Faster, longer life, and more run time. Install up to 2,600 linear feet with 2,000 nails per charge. 100% Compatible - with all RIDGID 18V slide battery packs. MG™ magnesium construction - durable and lightweight frame for tough jobsite applications. Selectable Mode Switch - allows contact or sequential actuation mode. Tool-Free Depth-of-Drive Adjustment - provides accurate depth control to protect work surface from overdriving. Dry-Fire Lockout - extends motor life and prevents missing nailers. Easy Maintenance - replace wear parts in less than 10 minutes. Tool Free Power Adjustment - regulates power for optimum results. Grip Light - engages light independently of trigger. Maximum Fastener Size 2-1/8 in. Minimum Fastener Size 5/8 in. Product Weight (lb.) 5.8 lbs. Includes R09890B Brad Nailer, (500) 1-1/4 in. 18 Gauge Brad Nails, Belt clip, Tool Bag and Operator’s Manual. 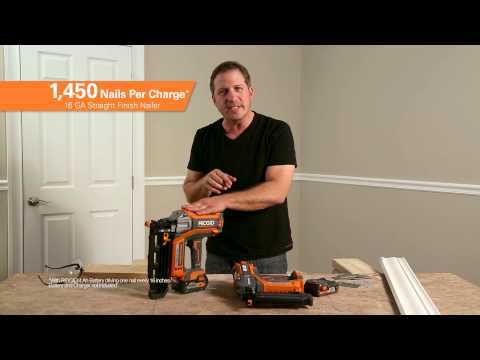 18V HYPERDRIVE™ Brushless Brad Nailer (Tool-Only) is rated 2.2 out of 5 by 13. Rated 1 out of 5 by Irratated from I purchased this one in 2013 because I was reluctant to spend the cost for another Paslode trim nailer. I should have known better. This has been the most anemic tool I have ever owned. From the very start, it has never driven a finish nail flush. In soft wood into drywall, it will not flush nail. I ALWAYS have to follow up with a nail set. I had hoped for better. All of the other Rigid brand tools I have work fine. Not this one. Rated 1 out of 5 by gmonetta from Won't sink nails anymore I hate to write a poor review regarding any Ridgid tools, however, this nail gun worked for half a job. Not only was it half a job, but the job was running 200 feet of shoe molding. The gun worked great at first, then stopped setting the nails. Like an idiot, I did not register the gun, at least I don't think I did because I can't locate it online, but to be fair, I can't find any of my Ridgid tools online for some reason. I know this nail gun has a lifetime service contract, but I'm sure since I can't locate the gun online Ridgid will not honor the contract. Again I used this gun for half of one job. The job was 4 years ago and this gun has been in my shop in a box stored away. The gun almost looks new, so, it is obvious it has very little use. So, in a nutshell, I like Ridgid products, I am just very upset about this one. Rated 1 out of 5 by eegs2k from Won't sink nails any more. fails to drive a 5/8 brad into pine. This tool worked great at first but after about 6 months it wont sink a brad. very frustrating! Rated 1 out of 5 by LimC from Underpower and overrated I had bought this around October of 2017 to try a cordless nailer. It was okay for basic carpentry like nailing half inch plywood. Unfortunately, I did not realize until February of 2018, when I started using it to install baseboards and chair rails that this tool is basically is useless. 10 out of 10 of my 2 inch nails did not sink! I am not even nailing through a stud! If I had known before the return policy expired, I would have returned this tool. RIGID customer service please help me resolve this waste of my $200! That would be greatly appreciated. Rated 5 out of 5 by Bandman from Out of the box- ready to go We bought this tonight for some finishing at my wife’s business- she owns a spa and salon. This is our first nail gun. We’ve always loved our Ridgid products and we’re still very pleased. The tool worked wonderfully right out of the box and I very quickly realized that the nail will do as advertised (and what you’d like it to do). For those of you saying you had a bad experience with Ridgid... not the case and not quite the opposite. Very happy Ridgid customer. Rated 5 out of 5 by jj95z28 from Does the job with perfection. First things first, this Brad Nailer DOES SET NAILS COMPLETELY BENEATH SURFACE, I have had no problems whatsoever even with some really dense/hard wood species. I hope people realize the depth is adjustable. Overall this nailer is amazing and has reduced my on-site service call time greatly! Thanks Ridgid. Where can I see the nail size choices? Thank you for contacting RIDGID. We found 18 gauge brad nails pictured on-line, at the SENCO website: http://www.senco.com/ . They offer a very large selection of fasteners and have pictures on their website.